Empty shoulder black sequins mini dress: front, back in 100% nylon, lining in 100% lycra, strap in 9..
White sequins midi dress: front, back in 100% nylon, straps in 100% cotton denim, lining in 10..
White sequins mini dress: front, back in 100% nylon, straps in 100% cotton denim, lining in 10..
Striped blue cotton trench dress: front, collar, undercollar, back, pockets, belt in 100% cotton; wi..
Striped blue cotton wrap dress: front, back in 100% cottonCOMPOSITION: 100% cottonCARE INSTRUCT..
Striped blue cotton midi dress: front, back, straps in 100% cotton.COMPOSITION: 100% cottonCARE..
White silk long dress: front, back, sleeves in 100% silk, with 100% cotton lace ribbonsComposition: .. Dark grey/navy plaid wool dress with frontal details: front, collar, undecollar, back, sleeves, pock.. 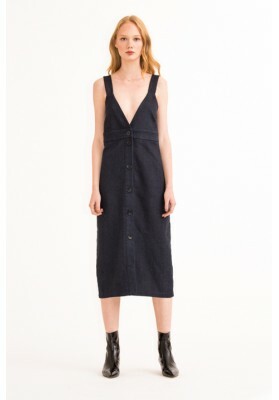 Wool denim dress with front buttons: front, back in 45,5% cotton, 45% wool, 6% polyester, 3,5% lycra..
Sequin black/gold dress: front, back in sequin (100% polyester); lining in 100% lycra; straps in 100..